Before I began my crust, I put water in a small bowl and stuck it in the freezer to chill. I cut the butter into pieces and put those in the freezer also. Then, in the bowl of my food processor, I pulsed the flour, salt, and sugar to combine. Then I added the chilled butter pieces and pulsed until they were incorporated with the flour, resembling course sand with a few larger pieces. Then I added the chilled water, one tablespoon-full at a time. The mixture should seem a little dry and crumbly, but if you squeeze a fistful of the dough, it should hold together. I dumped the finished dough on plastic wrap, then pressed it into a disk and put it into the refrigerator to chill. To make the filling, I first melted the butter in a microwave-safe glass measuring cup. Once it had cooled slightly, I added in the cream. In my enameled cast iron dutch oven, I heated the water and sugar over medium-high heat. I like to use a light-colored enameled pot because it makes it much easier to judge the color of the caramel. 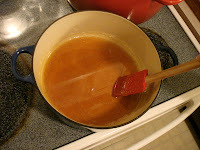 I will say that I did not use a candy thermometer, but the original recipe indicated that the caramel should be cooked to 268 F. I waited until the caramel reached a medium color (I was also fumbling with the camera, so it actually got a little too dark), probably 15-20 minutes. Once the caramel begins to change color, it goes from golden to burnt VERY quickly, so keep an eye on it. While the caramel was cooking, I rolled out the chilled tart dough then laid it in my tart pan, forming the shell to the flutes of the pan. Then I whisked in the cream mixture and the salt until combined. It WILL foam up initially, so it is important to use a pot that can accomodate the filling. Once the syrup and cream/butter were combined, I added the nuts in off the heat. 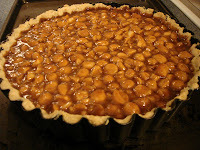 I poured the filling in my prepared tart shell, then placed the tart on a sheet pan to catch any ooze. I baked it for 30 minutes in a 350 degree, preheated oven, rotating halfway through. I covered the tart with foil for the first 15 minutes of baking. After 30 minutes, the edges of the tart were pretty well set. After the tart was baked and cooled, I drizzled melted bittersweet chocolate over the top. 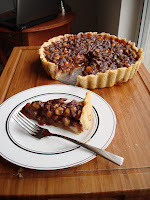 This tart could easily be made with any type of nut you prefer (toasted almonds would be good), but I love the satisfying crunch of macadamia nuts; they don't get soggy in the caramel sauce. Although this is not an inexpensive dessert to make, it is beautiful for a special occasion and is worth the cost. Be creative and enjoy! Thanks, David. Sorry there wasn't more for you to take home!